A neighborhood mainstay for the past decade, West Side Caroling will fill the streets with song once again on Sunday, December 17, 2017. Get details here. Ten years ago, the economy was in the tank, many people were out of work, and spirits in Providence and Rhode Island were low. Amidst the gloom, two west side neighbors got to thinking. What costs nothing and still brings joy? With the holidays fast approaching, Elaine Collins and Mike Ritz got an idea: singing carols, the old school kind that take you door to door. Just a few weeks before December of 2008, Collins and Ritz drummed up a plan they hoped would bring neighbors far and wide together with a common purpose: to spread cheer throughout the neighborhood by sharing the gift of song. They invited musically talented friend, Glenn Zienowicz, to join them and asked loads of neighbors and friends to gather at Loie Fuller's, not knowing how many would come or what the evening would bring. That night some magical things happened. 50 people showed up. Neighbors spontaneously brought out drinks and treats to carolers. One family – in an act of kindness that astounded carolers – invited the group into their home where songs continued with piano accompaniment and hot chocolate. But for organizer Mike Ritz the standout moment came the first time a doorbell was rung and a family with young children gathered at the door to see what was happening. Remembering the picturesque scene, Ritz added, "I think there was even a dog!" Ritz, in Santa suit and wielding a megaphone, asked the somewhat-stunned family to pick a song they'd like to hear. The kids requested Rudolph the Red-Nosed Reindeer and the carolers broke out in song. "This is why we keep doing it every year. It's for this moment." Occurring on the Sunday before Christmas every year (except this year), West Side Caroling has grown from 50 people to over three hundred. As the event has expanded, Collins jokes that the group, doing their diligence to keep everyone on the sidewalks, has become a bizarre and funny "inchworm of song." This is where "maestro" Glenn Zienowicz, the musically talented friend who joined in the first year, is crucial. Invited initially as a ringer to keep less-musically-talented carolers in tune, Zienowicz, music director at Nathan Bishop Middle School, is now officially or unofficially the event's conductor, and earns his cookies along the way trying to keep the group together musically. Some years Ritz and Collins have planned stops along the way at various neighbors' houses or businesses that volunteer such as Hudson Street Deli or, one year, a Harrison Street backyard where a neighbor had built a bonfire to warm carolers. Local businesses get into the spirit, as well. Every year El Rancho Grande supplies a traditional Mexican hot mulled fruit punch called Ponche Navidad that is enjoyed at some point during the 2 hour caroling journey. And for the past four years Julians has generously supplied individually-packaged cookies for all carolers. 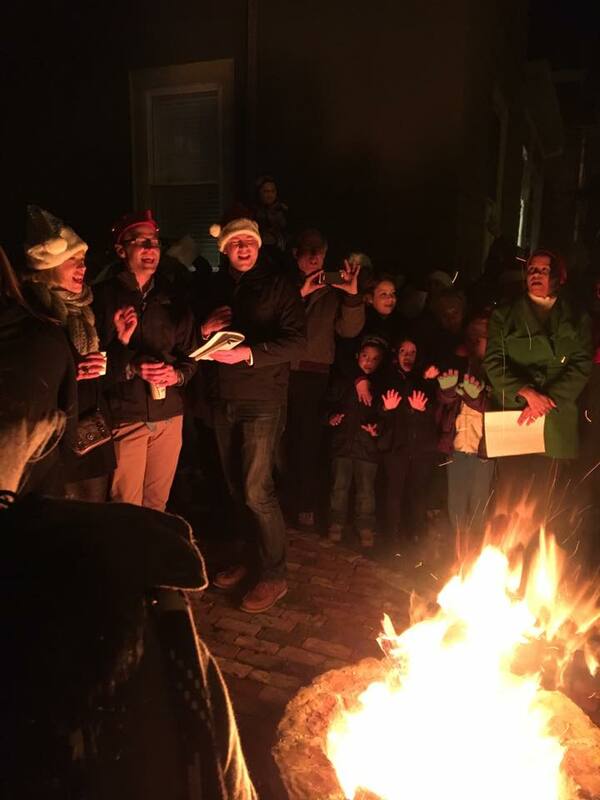 Ritz offers Providence Monthly's description of West Side Caroling as "not your grandmother's singalong" as a way to underscore the event's special kind of west side edgy character. But the organizers are clear as a Christmas bell that this event is inclusive, family-friendly, and has become a tradition for some west side neighbors and families alike. "Some of the families have been caroling with us since their kids were really young. Those kids are now young adults and teenagers, and West Side Caroling has become part of their family's holiday tradition." While the event is officially secular, it became difficult to limit the carol list to non-religious songs. Instead, Collins, Ritz and Zienowicz try to be as inclusive as possible by featuring seasonal favorites representing many groups and religions – Jewish, Christian, Rock n Roll, and even Lovecraft's Scary Solstice spinoff carol. Every year, carolers end the evening of song with John Lennon's War Is Over (Happy Christmas) followed by cookies and warm drinks courtesy of a kind business or neighbor that has volunteered to host. This year the event will end at Sin Bakery at 1413 Westminster Street. This event is all about good cheer – spreading joy and sharing in song with neighbors. It is an experience that welcomes everyone, young and old, families and singles, hipsters and squares. 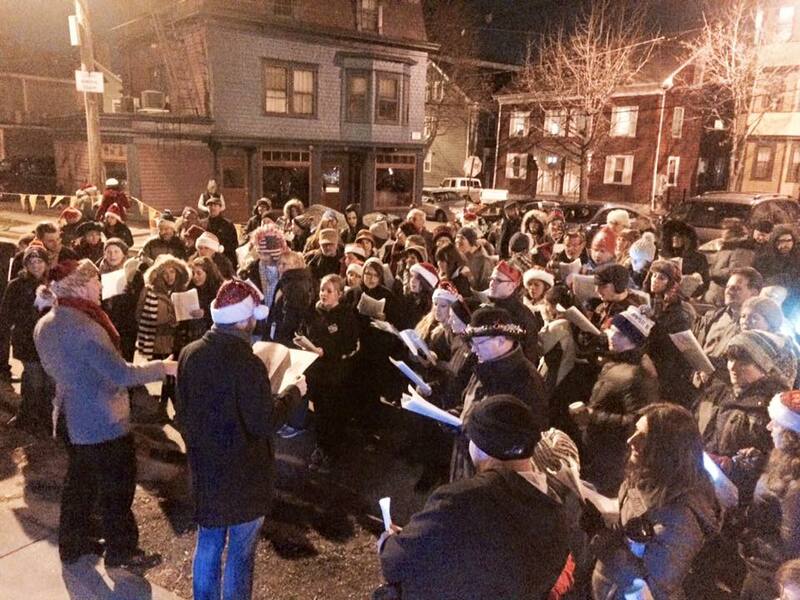 West Side Caroling is generously sponsored by West Broadway Neighborhood Association, Leadership Rhode Island, Loie Fuller's, Julian's, El Rancho Grande, Puroclean, Fertile Underground, Hudson Street Deli, and Sin Bakery. Mike Ritz and Elaine Collins received the 2016 Fueling Community Award from the WBNA for their initiative and efforts in building community through the annual West Side Caroling event. Newer PostThe numbers are in: Giving local matters!